Before we go any further, let me show you the before photos of this space and how we got to today. 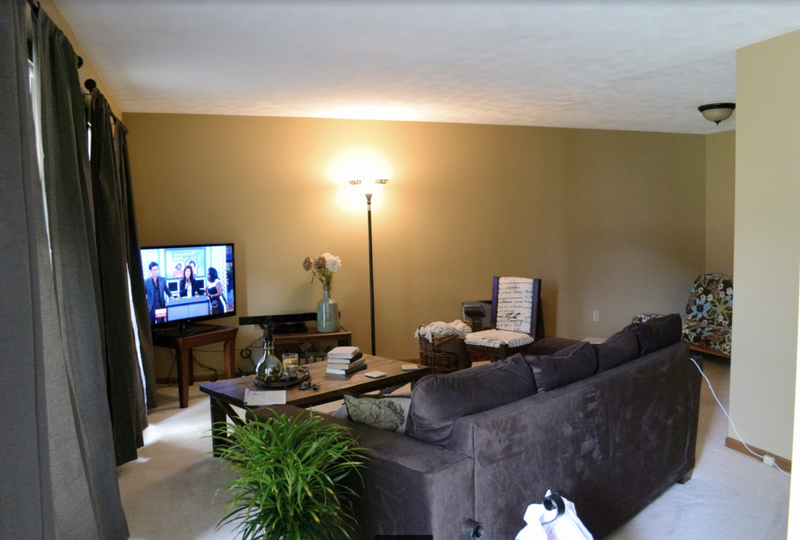 When we moved in, we had white carpet and I originally painted the walls a tan/yellow color. I used the furniture we had/built, and made the space work for us. But, ultimately your needs changes as a family and your taste changes. So, we decided to start doing some renovations. Over time my style evolved and I started to accumulate more pieces I loved. As you can see, the living room is an L shape. It’s made it difficult to make the best use of this space. Then, the carpet was replaced and the walls got a fresh coat of paint! After that, I made half of the room into the dining area and the other half the living area. In order to really know what we loved best and made the most sense for us, I tried EVERY possible option for moving furniture around. We also tested EVERY possible option for a TV location and decided I liked it on this wall the best. But, I wasn’t loving how it looked and was functioning. INSERT MY BRILLIANT IDEA HERE. We decided to make this wall a beautiful accent wall and DIY some built-ins for storage, visual beauty and to meet the changing needs of our family. To see the entire process from start to finish of the accent wall, check out this post real quick then come on back over here. Once the wall was complete, the space looked like this. Better than before. But, not finished. We started by building two floor to ceiling bookcases on each side of the wall and roughing out a frame for the bench seat in the middle. We did many test fittings of shelf height, width, etc. Dimensions don’t really matter at this point, because it’s custom fit to the space we were working with. I primed and painted a million things. Once we had the bookcases in place, we could focus on building the bench seat to fit the space. The best part about the bookcases is the trim. It makes it look SO beautiful. Anyone else get in a hurry to decorate before it’s actually done? Are you ready for the AFTER pictures? I can’t even contain my excitement. It doesn’t even look like the same room! That’s the beauty of it all. Let me put them side by side. Don’t ever be afraid to try something new. Our home keeps evolving as we figure out how to better use the space we have and meet the needs of our family today. Newer PostFriday Favorites: What's in my Target cart! Older PostBench / window seat cushions for every budget.